Empower your team with true ad hoc reporting.Leverage powerful ad hoc reporting to uncover insights from every dimension of your business. With Bullhorn Canvas, you can build any type of report and gain complete visibility into the state of your firm. Bullhorn provides cloud-based CRM and operations solutions for the staffing industry. Its automated data capture and customer insight technology helps companies engage candidates and win customers. Today, more than 7,000 companies rely on the Bullhorn platform to help increase sales, improve service delivery, and streamline operations. Headquartered in Boston, with offices around the world, Bullhorn employs over 600 people globally. The company is founder-led and backed by Vista Equity Partners. uild any report imaginable With Bullhorn Canvas, you can build any type of report to uniquely understand your business. 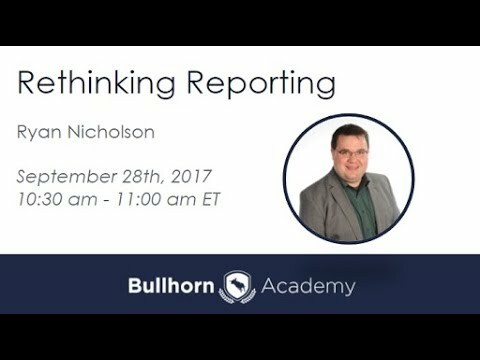 In this webinar we'll show you various ways that you can report on data in Bullhorn.